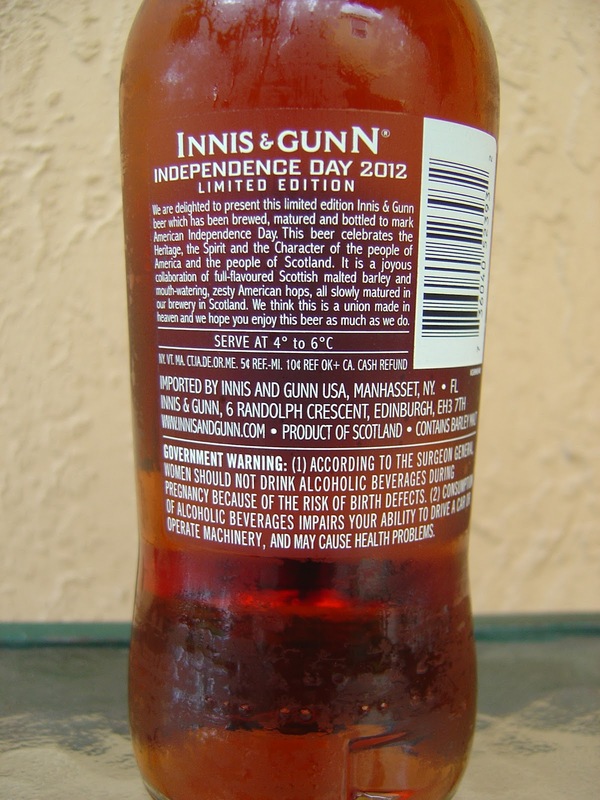 Today I'm drinking Independence Day 2012 brewed by Innis & Gunn in Edinburgh, Scotland. My 11.2 ounce bottle is, as usual for these guys, made from clear glass. 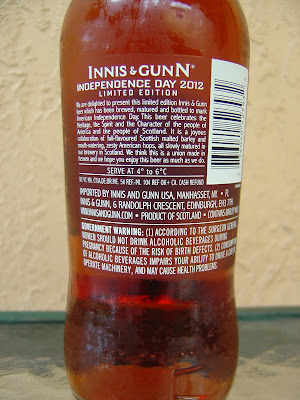 This limited edition beer was brewed to celebrate the US Independence Day, yet is a "joyous collaboration" of Scottish Malts and American Hops, according to the story on the back. After brewing the beer, it is aged in oak for 54 days. Serve 4-6°C. Sweet, malty caramel aroma with tons of oak and lots of vanilla. Nice rich caramel flavors with loads of oak and vanilla, very smooth and creamy, every buttery. But wait... there is a definite hoppy citrus relief to that richness up next. A little orange, a hint of lemon and a nice floral contribution. I do like the way the two components take turns, up and down on the see-saw. 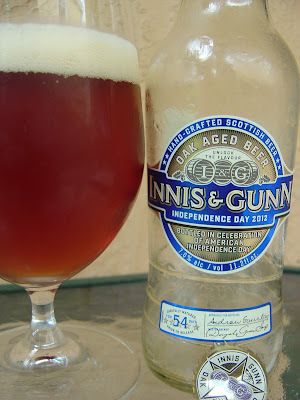 That little hoppy, spicy nip adds some interest and cuts the initial sweetness in a good way. The finish shows a little boozy 7% alcohol, also in a good way. The 4th of July isn't for a few weeks yet, but thanks a lot guys for delivering this present. Nice job.